On the whole, FastComet is one of the best Magento hosting choices out there. The plans are all quite affordable, and you do not even need to worry about expensive renewal rates or other surprises because prices are fixed. More than that, you also get unlimited bandwidth across the board, unlimited SSD storage on their most premium plan, and numerous freebies. Like any other company, however, they are not perfect. But the cons of their service, such as the lack of Magento themes, are too minor compared to all the benefits they offer. In short, FastComet is definitely worth a look if you need Magento hosting. Unlimited Bandwidth: FastComet promises unmetered traffic for your website. Hassle-free Transfers: FastComet offers free, fast, and easy website and domain transfers performed by actual technicians, which lessens the risk of an automated system messing things up. Fixed Prices: FastComet doesn’t pull the introductory price bait-and-switch trick; instead, the price that you got during sign up is what you will be paying for come renewal time. Freebies: FastComet plans come with a lot of freebies, like a lifetime free domain, CloudFlare CDN, free Magento installation, and more. Setup Fee for Monthly Plan: The monthly plan comes with a one-time $19.95 setup fee. 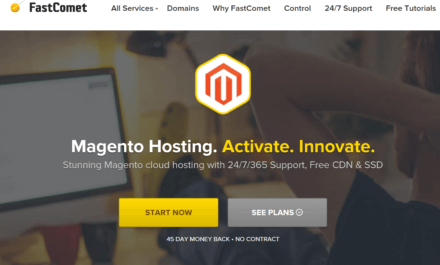 No Magento Themes: Unlike other web hosting providers, FastComet does not offer free themes with their Magento hosting plans. For those interested in starting a Magento eCommerce website, FastComet is definitely a good hosting choice as they offer a lot of benefits at affordable prices. Plus, they also throw in numerous freebies that would have otherwise cost extra with other web hosting providers. So what do you get with a FastComet’s Magento hosting service? For starters, you get free Magento installation via an easy 1-click installer, as well as free website and domain transfers. If you are a beginner, the numerous step-by-step tutorials and 24/7 Magento support can help you become an expert in no time. And if you need to extend the features of your Magento website, then the free extension installation can definitely come in handy. You also get SSD storage and a free CloudFlare CDN which, when combined, should give your website the speed and stability it needs to reliably provide for your customers. Of course, those two are just a part of the equation, as FastComet also provides other measures that ensure your website is not only speedy and stable, but also secure. Your website is guarded against malware and other malicious content thanks to a free virus scanner and malware removal service, while an Application and Network firewall keeps known security threats at bay. Then there is the Apache SpamAssassin tool which ensures that your email is spammer-free. And finally, if ever something goes horribly wrong with your website, your mind can immediately be put at ease thanks to FastComet’s free daily and weekly backups. They give customer unrestricted access to all their backups via the web-based Restore Manager. Even better, this tool provides 1-click restoration so even the less tech-savvy of users can easily bring their website back from the brink. FastComet offers 3 Magento hosting plans that you can choose from: StartSmart, ScaleRight, and SpeedUp. If you only need a single Magento website, then the StartSmart should be more than enough to cater to your needs. The ScaleRight plan, meanwhile, allows you to host multiple websites, while the SpeedUp plan provides all that you need in order to run a robust online store. All of these plans offer free domains for life, free website transfers, unlimited traffic, free CloudFlare CDN, unlimited email and databases, cPanel, Softaculous, and the daily and weekly backups. The difference between plans, aside from the number of websites you can host, comes down to the storage space as well as the advanced features offered by the premium plans. Both the ScaleRight and SpeedUp plans, for instance, offer more storage, a free GlobalSign SSL certificate, a 200-300% performance boost, one-click file restore, and even priority support. Check out the table below for a quick rundown of each FastComet Magento hosting plan. Overall, FastComet provides stellar customer support, not just because of the round-the-clock availability, but also because they provide complete support for your Magento website. You can peruse a dedicated resource page that tackles everything Magento-related – from installation to configuration and beyond. They can also handle those tasks for you, if you need help with installing, optimizing, or transferring, for instance. And if you prefer to just talk with a support representative, you can do so via phone, email or live chat. What's the Verdict on FastComet? By all accounts, FastComet is a pretty simple Magento hosting provider, eschewing gimmicks in favor of customer-friendly features. They are one of the few web hosts out there that does away with slightly deceptive introductory prices, and instead offers a fixed pricing scheme. They also provide a ton of freebies that would have otherwise cost extra with other services, such as free website and domain transfers, free daily and weekly backups, free CloudFlare CDN, and even a forever free domain. It is this act of going against the grain that makes them one of the best options out there. Of course, some may not like that FastComet requires a $19.95 setup fee for month-to-month terms, or the fact that they do not include free Magento themes for you to use, but in the grander scheme of things, these are very minor gripes.